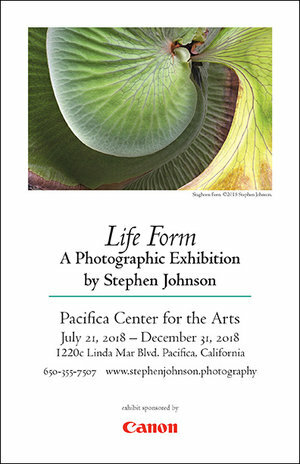 Other Worldly Exhibitions at Stephen Johnson Photography. Pacifica Center for the Arts. 2019. Canon EOS 5DSr. Welcome to the April 2019 Edition of the Stephen Johnson Photography Newsletter. Hanging a new show takes everything I’ve got. I’m often very proud but also exhausted. My attention gets so concentrated, naturally, on the photographs that I sometimes forget the commerce side all together. But then, I turn, catch up with email and webpages some of what I should have done. Now there is a Space prints page, Expanded SJ Photo Editions offerings and many cool new additions to the show. Come see us. I’m doing a talk on 50 Years of Space Photography on April 28. This month's View From Here column jots down a few thoughts on photography and time. We hope you find the column interesting and will consider sending us some comments. Check out the new workshops we’ve added, including Lighthouses of the Bay Area, Color Management and Your Vision, Your Craft portfolio building class at Maine Media Workshops in June. Wave Tower.. 2018. Canon EOS 5DSr. New Lightouse Workshop: We are excited to be offering a new workshop In 2019 that focuses on the Lighthouses of the San Francisco Bay Area coastline with the beautiful landscape and ocean settings that they have become monuments to. 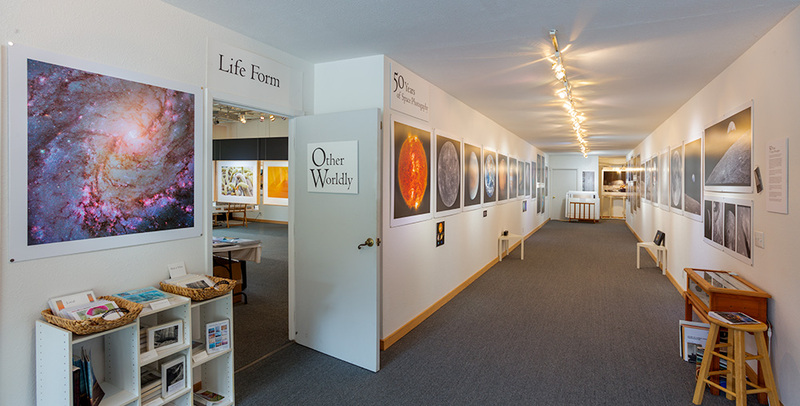 Other Worldly opened Sunday March 17 joining the new Space Exhibit with the Life Form Exhibition on display at Stephen Johnson Photography. 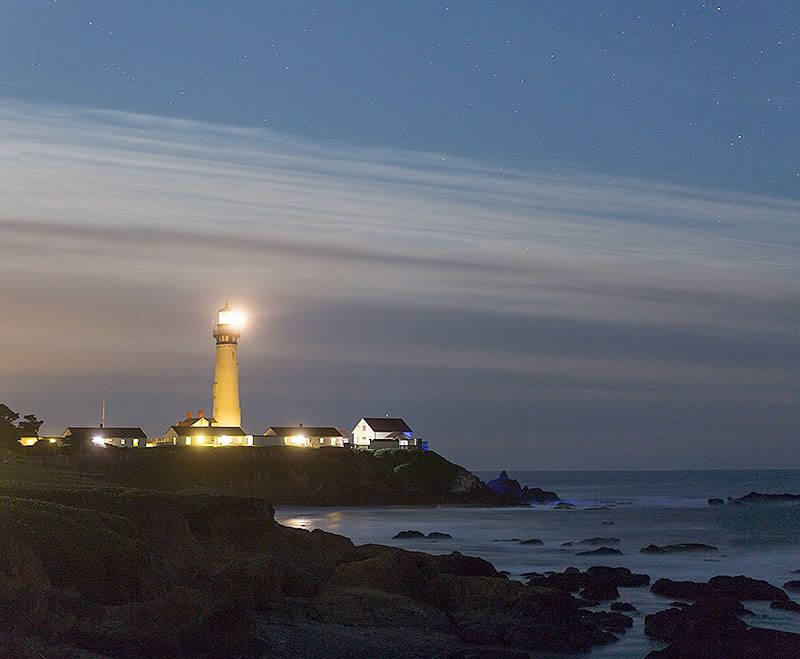 Pigeon Point Lighthouse. 2011. Canon EOS 1Ds III. 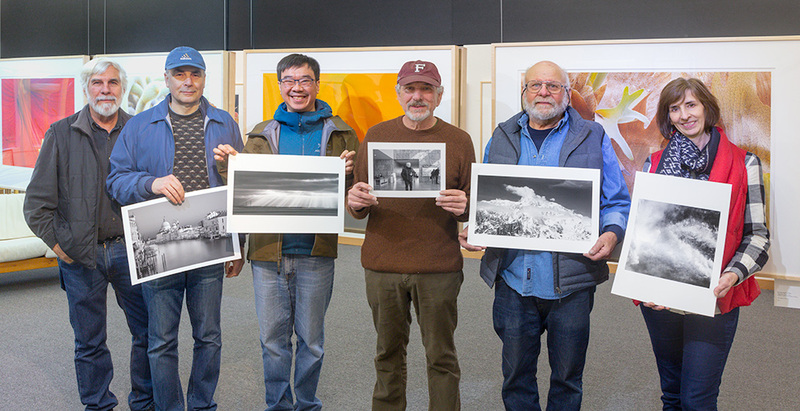 Black and White Printing Workshop February 2019. 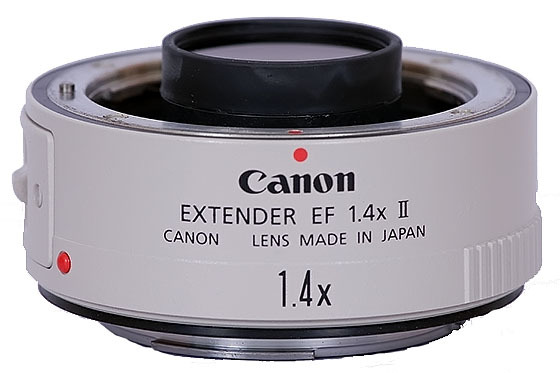 Canon EOS 1Dx. Wildflowers and Clouds near Carrizo Plain, CA 2019. Canon EOS 5DSr. On my way today to the Carrizo Plain, chasing the late wildflower superbloom. Went down an unplanned road and found 30 minutes of real commiseration with the sun, wind, clouds, hills, and dancing waves of grasses and flowers. The evolution of exotic complex form is encoded in so many manifestations. Moth Orchid. Shelldance Orchid Gardens. 2013. Canon 1Ds III. When we look into the night sky, we are looking back in time. When we look deep into the complex organs of an orchid bloom, we are looking back in evolutionary time. I’m not sure exactly how these relate, but there is some notion forming in my mind that the present is even more transient than this moment passing to another. Everything we witness is old, very old in some fashion. Even in the specimen before me that has just bloomed, it is unfolding from millions of years evolving and genetic imperitive. So much of what we do tries to hold time. Photography certainly does. It’s an impossible goal, but so commonly human. We write of things that occur, tell stories, take pictures, try to fix moments. And we do fix evidence, light, stories of what once was, sometimes only moments ago. Fiction is different, as is painting. Used in particular ways, images, still and moving hold evidence of what was. Just as that night sky is a tale of the distant past. The most recent light/time we see happened four and half years ago in the three-star Centauri System. Crab Nebula. Hubble Space Telescope. NASA. 1999-2000. 6500 light years away. Seen from Earth exploding in 1054 AD, already 5400 years after the event. It’s no wonder fantasy and fiction hold such fascination. They side-step time, often traveling faster than light itself. They are our creations, not our records. As we try to record, maybe we are trying to cheat time, hold onto it. As I look back the pictures of my beautiful golden retriever Sandy, who has only been gone months, the photos cheat her death away, just a little. Perhaps painfully so, but nonetheless preciously. Nostalgia isn’t just the longing for a made-up simpler time, it is also a rebellion against time. It is strange, as all of my life I’ve sought to record the preciousness of what I see, mostly the natural world, but also the beings I love. It makes me worry out loud, are my photographs also some instinctive need to hold this sacred earth in some sort of time stasis, immune from the the changes we are wreaking? That seems apocalyptic, but the thought did wander through my mind. Human time can’t really take in the wonder of lightning. The photographs reveal time -encoded letting glimpse the wild form. 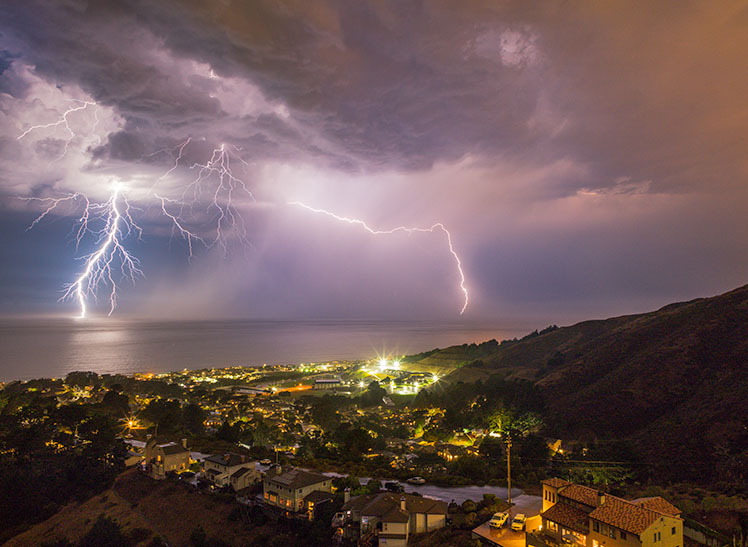 Lightning over Pacific. 2017. Canon 5DSr. The wonder that is a journey to Antarctica also leaves me with a profound feeling of how temporary this view might be. 2007. Canon 1Ds II. Milk Droplet. Harold Edgerton. Library of Congress. Part of the pull of photography is to see and share the rare or near impossible. A spark of lightening, looking back on the earth from beyond the moon, a time-lapse of a water droplet striking still water. Stepping out of our normal experience into visions we can’t normally take in. Our machines are yet crude, our capabilities limited, but the wonder we have already managed to bear witness to is often right on the edge of belief. Maybe I’ve spent a little too much time with the space photographs lately, but it seems I am starting to see these images in new ways, and in turn seeing my work in new ways. The photons striking my retina from a star, light years away, actually came from that star, birthed from it. Sandy’s beautiful golden fur was touched by the light, the photons from that touch struck the silicon in my camera, emitting electrons we reconstitute as visual imitations. What we are actually doing is bizarre, clever, deeply strange, and may well be trying to cheat time. My place here, amid all of this, is, curious. My role ambiguous, my passion for it all somewhat hard to fathom. But here I am, working away. I keep going back the real things I’ve witnessed with my own eyes, and the journeys they have taken. The Apollo 11 Command Module comes to mind, as does the Space Shuttle Columbia. The reality of the Apollo 11 Command Module Maneuvering Thrusters seen above the moon (just to the right of the left antenna) and right before my eyes makes the journey and photography re-shape the mind a bit. My brief experience with the Space Shuttle Columbia is more problematic. The adventure of space travel has always drawn me in. I could barely believe I was going out to the launch pad at the Kennedy Space Center in 1996. Although I had long sense chosen a life path that would not likely take me to space, that aspiration was close in my mind that day. Standing on the launch gantry, staring out on the tail-wing, looking and its high tech covering that resembled fiberglass, I clearly remember feeling a dread, thinking I have precious children to raise, a whole life still ahead of me, that I would not ride on this spacecraft. I’ve never forgotten that moment. When the Columbia was lost in 2003, that was of course not what was in the front on my mind, but the thought has had a haunting quality over the years. Apollo 11 Command Module over Moon.. NASA. 1969. Hasselblad with Zeiss Lens. 70mm Kodak Ektachrome. Apollo 11 Command Module. Maneuvering Thruster Close-up. Air and Space Museum. Washington DC. Stephen Johnson. 2017. Canon EOS 5DSr. On Launch Pad 39B with Space Shuttle Columbia. 1996. Kodak DCS 460c. The Columbia would have 10 more flights but did not complete its last mission due to wing leading edge tile damage. breaking up the Spacecraft on re-entry in 2003. All seven astronauts of mission STS-107 were lost. Please email any essay comments you may have. On Commerce: A Few Questions from all of you. — What is affordable to purchase or enroll in right now? 38 large prints are up, The Space Imaging Tech display case is built. I’ve been finding some awesome schematics of the Apollo program and making prints. We’re delighted to show it all off. Please come and see the show. We are very proud of these exhibits. There are more prints to show than I have wall space, so there are a number of prints in bins to view and purchase. I’m doing a talk at my studio on 50 Years of Space Photography on April 28, 2019 at 4pm. The upcoming Photoshop Editing, Color Management class and Fine Art Printing workshops are open for enrollment now. Enroll while there is time and space!. I’ve always been drawn to historical photographs and maps. I’ve been collecting 19th century books, engravings and now making scans of photos and maps. Printed on just the right paper and sheen, the reproductions are often vey special in their own right. So I’ve decided to make some of these prints available as I print them and discover more. The first few are from the San Francisco Bay Area, local to my home in Pacifica, We’ll make them both available as 8x10 ($35-$45) and 11x14 ($75-$85) with larger sizes available for quote. The Gallery of current offerings where you can place orders can be found here. Sugarloaf Rocks. 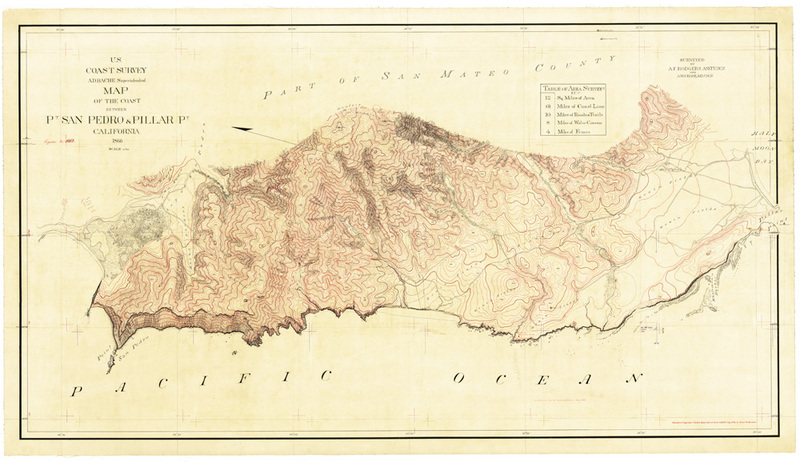 Farallon Islands. Carleton Watkins. I have been printing out nice copies of the Constitution and Bill of Rights on rich cotton paper. You are welcome to a copy if you come by the gallery. A collection of photographs in and around Pacifica California. Include a trail map.